Discover a wide variety of Western Canada\'s rich wildlife as you travel through the majestic scenery of the Rockies and explore British Columbia\'s stunning coastline. As this tour uses scheduled transportation throughout, you are free to tailor the itinerary to your own requirements (subject to schedules), just let us know what changes you would like and we will provide a bespoke quotation. Upon arrival at Calgary Airport you will be greeted by our representative and transferred to Banff. Today you have a free day for shopping or independent sightseeing. 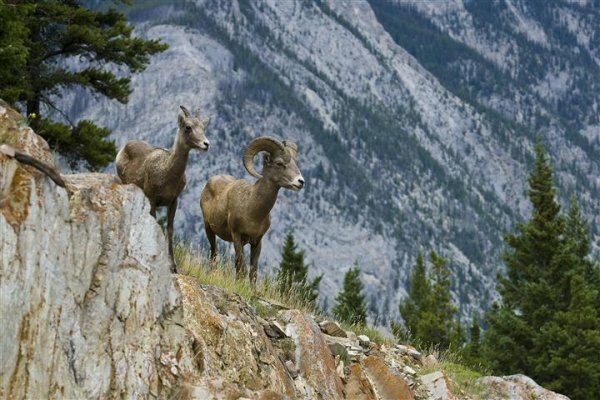 Banff offers a wide array of soft adventure activities, from scenic hikes to museums and art galleries. 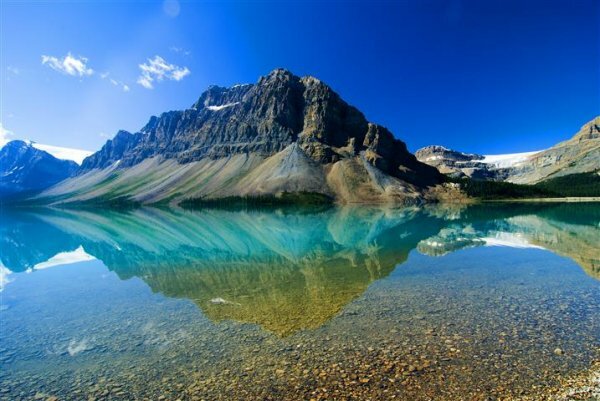 You may choose to take the optional â€˜Discover Banff Tourâ€™. This morning, you will join a sightseeing transfer to Jasper. Journey from Vermilion Lakes to the â€œJewel of the Canadian Rockiesâ€ Lake Louise. Then shadow the Great Divide exploring the natural viewpoints of Crowfoot Glacier and Peyto Lake. At the Columbia Icefield you will ride on an all-terrain Ice Explorer and sip on the fresh waters of a glacier. Continue on through the Sunwapta Valley and take a stroll at Athabasca Falls before a late afternoon arrival at Jasper. 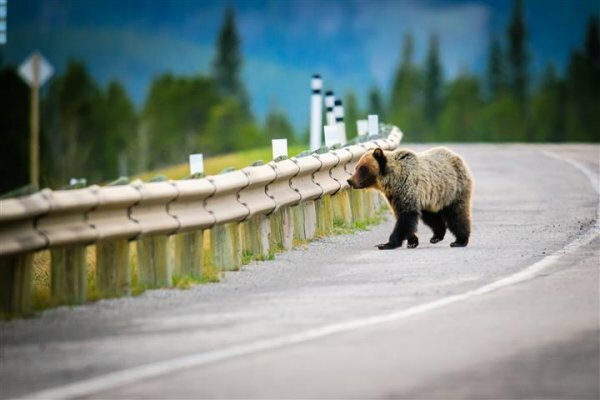 Today you will have a free day to explore Jasper, or take an optional â€˜Jasper Wildlife Tourâ€™ in search of Osprey, eagle, big horn sheep, mountain goats, moose, elk , deer and bears. Explore Jasper at leisure this morning, before transferring independently to the Jasper rail station to board VIA Rail â€œThe Canadianâ€. The train departs Jasper at 14:30. Overnight on â€™The Canadianâ€™,in a private cabin for 2. You will arrive in Vancouver at 9:30 am. Upon arrival, collect your baggage and transfer independently to your hotel. The remainder of the day is at leisure. You may choose to take an optional Vancouver City Tour. Enjoy the day at leisure exploring Vancouver or take an optional day excursion to Whistler or Victoria. 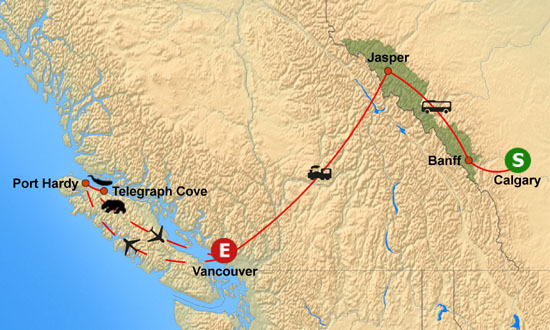 Make your own way to Vancouver Airport for your scheduled flight from Vancouver to Port Hardy. Upon arrival, transfer by taxi to Telegraph Cove Resort where you will be spending three nights. Today you will join a tour to Knight Inlet to find grizzly bears. You will view the bears from the safety and comfort of big flat bottom viewing boats. Don\'t forget to bring your binoculars and camera! 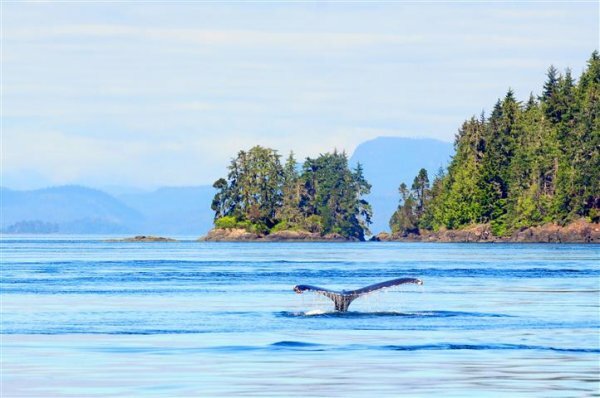 You will cruise the calm, protected waters of Johnstone Strait & the Blackfish Archipelago on the northeast coast of Vancouver Island today. The area is acknowledged as the most accessible and predictable location to see Orca (killer whales) in the world. This beautiful area is home to a wealth of other marine wildlife. Dallâ€™s porpoises, harbour porpoises, Pacific white-sided dolphins, sea lions, seals, Minke whales, humpback whales and grey whales are some of the marine mammals you may see during your nature cruise. For bird watchers, migrating bird species in the Pacific Flyway include rhinoceros auklets, pigeon guillemots, harlequin ducks, sooty shearwaters and bald eagles. This morning you will take a taxi transfer to Port Hardy Airport for your schedule flight to Vancouver. Upon arrival, make your way independently to hotel. Tour ends. Transfer independently to Vancouver Airport and check in for your flight home. 10 nights hotel accommodation on room only basis. Scheduled transportation from Calgary Airport to Banff hotel. Sightseeing transfer (9 hours) from Banff hotel to Jasper hotel including commentary. 1 night on board VIA Rail \'The Canadian\' in Sleeper Touring Class from Jasper to Vancouver in private bedroom compartment for 2 pax including all meals on board. Return scheduled flights between Vancouver and Port Hardy. Return taxi transfers between Port Hardy Airport and Telegraph Cove Resort. Grizzly Bear Expedition including lunch.